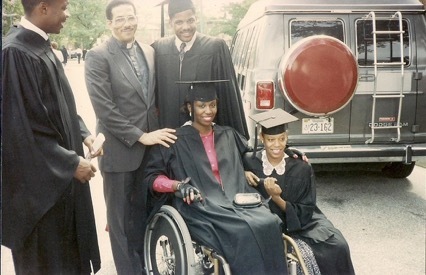 Thirty-two years ago, I was a wheelchair-using college senior at Hampton University in Hampton, Virginia. I knew very little about disability employment or inclusion. I just knew that like many of my peers, I had to get a job. I went through a number of first interviews, two second interviews and didn’t have a job when I rolled across the stage to get my diploma. This pre-dated the Americans with Disabilities Act (ADA) and companies didn’t discuss advancing disability employment the way they do today. In the 28 years since the ADA became law, a lot has changed. You can easily find articles on ‘disability inclusive best practices’ on social media, and increased focus on engaging the community as employees and consumers. Great strides have been made and I celebrate those. However, there remain uncontested market opportunity for companies that prioritize disability inclusion. Each October, the country recognizes National Disability Employment Awareness Month. This year’s theme is America’s Workforce: Empowering All. As your company plans events for the month, and beyond, I strongly encourage you to establish metrics for disability inclusion. Otherwise, it’s expendable as corporate priorities shift if not tied to the bottom-line. Fashion Styling for People with Disabilities: Stephanie Thomas is founder, stylist and editor-in-chief of CUR8ABLE, a disability fashion lifestyle website. With a passion for accessibility, Stephanie has followed clothing trends for people with disabilities for 24 years and works to empower people every day with advice from her disability fashion styling system. Based in Los Angeles, with followers spanning the globe, Stephanie strives to create beautiful, powerful images that challenge and ultimately change negative perceptions of people with disabilities. Unlocking Diverse Abilities: How to Create Accessible Workplace Culture: Jennifer Brown is a leading diversity and inclusion expert, and host of The Will To Change podcast, which uncovers true stories of diversity and inclusion. On this show, she interviews Kathy Martinez, Senior Vice President, Disability Segment Market Brand & Strategy for Wells Fargo & Company, who shares her unique diversity story and how she came to be aware of and involved with efforts to create a more just and equal society. Kathy reveals why creating more accessible products and services ultimately benefits all consumers and why it makes good business sense. She also discusses misconceptions that leaders often have when it comes to workplace accommodations and the return on investment that comes with accommodating the needs of all employees. Job Accommodation Network: JAN provides free consulting services for all employers, regardless of the size of an employer’s workforce. Services include one-on-one consultation about all aspects of job accommodations, including the accommodation process, accommodation ideas, product vendors, referral to other resources, and ADA compliance assistance. The Hidden Market: The Purchasing Power of Working-Age Adults with Disabilities: The needs of adults with disabilities are frequently overlooked in the marketplace and when businesses are designing and promoting products and services. An April 2018 report from the American Institutes of Research finds that inclusive hiring practices and involving people with disabilities in product development and advertisement can help businesses access a market worth billions of dollars. The Power of Family and Friends: Family and friends of people with disabilities is market of approximately 105 million.They influence purchase decisions and respond to companies that are disability inclusive. In this video, I share effective tips to reach this segment of consumers. I’d love to learn more about how you, or your organization will recognize National Disability Employment Awareness month. Send me an email or post on our Facebook page! Industry standard-bearer, JPMorgan Chase & Co., has further cemented its commitment to diversity and inclusion with the hire of James (Jim) Sinocchi, Head of the Office of Disability Inclusion. A vanguard in his own right, Sinocchi has promoted disability inclusion awareness for decades. In this new position, he will partner with JPMorgan Chase’s senior leaders to establish consistent standards and processes supporting employees with disabilities and employees who care for family members with disabilities. Prior to joining JPMorgan Chase, Sinocchi served as the co-chair of the IBMers with Disabilities Global Task Force. While there, he collaborated across multiple internal and external channels to create awareness and understanding of policies, initiatives, and Human Resources and Diversity programs. 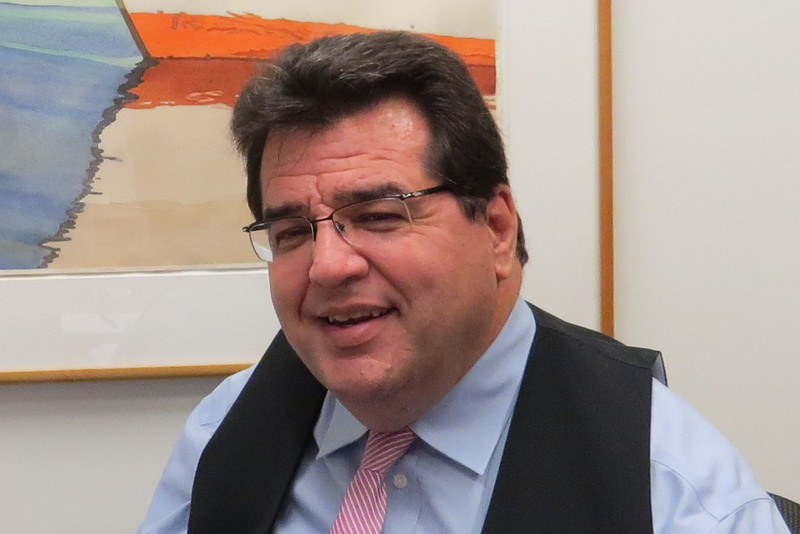 Sinocchi uses his considerable skillset to serve the community as a board member of organizations committed to supporting people living with disabilities. His business acumen makes him sought-after, but his empathy and passion have made him a pioneer. Since 1980, Sinocchi has lived with C5-C6 quadriplegia, the result of a New Year’s Eve surfing accident. In this month’s SMG Profile, Jim reflects on the intangibles and tangibles that sustain innovation and inclusion in the workplace. SMG: When did JPMorgan Chase institute the Office of Disability Inclusion? Sinocchi: JPMorgan Chase has for years worked on improving access to people with disabilities and fostering a culture of inclusion for employees. The company long sought to improve the employee experience, engage with outside organizations (particularly with advocacy organizations), products, and services for people with disabilities. One of our nine firm-wide business resource groups is dedicated to providing a voice for employees with disabilities and those who serve as caregivers. A little over a year ago, our executives decided they needed to take the step of creating an Office of Disability Inclusion to increase focus on matters related to employee accessibility and drive consistency in our methodology, standards and practices. SMG: Jim, when did you join the company? Sinocchi: I joined in June 2016. SMG: How has the direction of disability inclusion changed over the last twenty years? Sinocchi: The mindset of companies 20 years ago was, “Let’s hire people with disabilities. Let’s give them jobs.” Today’s mindset – at forward-thinking companies – is, “Let’s hire people with disabilities, and see who among them has leadership potential.” Stereotypes and attitudes have changed and people with disabilities are being promoted to middle and upper management roles. However, people with disabilities continue to face barriers to equal opportunity at work. I use The Four A’s to serve as a roadmap for hiring people with disabilities and enabling them to contribute to the company, and the country. The Four A’s are: Attitude, Accommodations, Accessibility and Assimilation. If companies work on those four areas, they’ll become part of the new era of hiring people with disabilities and enabling them to contribute to the company and the country. SMG: How did you develop the Four A’s? Why do you like it as an approach for inclusion? Sinocchi: I was trying to come up with an answer to the question: “How can a company make someone with a disability feel truly comfortable and help that individual succeed?” Companies can teach people with disabilities how to be leaders just as they do with able-bodied people. When people with disabilities are seen as C-suite leaders, accessibility and inclusiveness will enrich that company’s culture. We can also teach managers and executives to recognize leadership potential in a person with a disability. Here’s a secret: it’s the same methodology used with an able-bodied person. That acknowledgment alone will change paradigms and break the glass ceiling for the employee with a disability. We’ve done it with gender, with orientation, with race, with religion – but we haven’t done it – yet – for people with disabilities. Assimilation will be the real game changer – the mark of a great company. When people with disabilities can assimilate with their able-bodied colleagues, when people talk to a colleague with a disability and don’t think about their disability, we will know we’ve made a lasting difference. SMG: How do the four A’s work, specifically at JPMorgan Chase? Has disability inclusion changed at JPMorgan Chase since the Office of Disability Inclusion began? Sinocchi: JPMorgan Chase looks at the whole employee when they join the company. We look first at what the individual can contribute to both the company and our clients. We make it clear that we want people for their intellectual capacity and talent and we will do everything we can to accommodate them in a reasonable manner. The Four A’s codifies this though, making it easy for people to understand what we’re trying to accomplish. Rather than use medical jargon or scientific data, The Four A’s are already in people’s vocabulary and represent the standard dictionary definition of each word; it’s straightforward so that people who manage and work with colleagues with disabilities realize it’s just about how we treat people and make sure we’re not afraid of being politically incorrect. To help break down the barrier of “political correctness,” we launched a video series called “The Disability Dialogues,” where senior managers sit down with employees who talk about their disabilities. They speak openly about challenges they face and any they’ve overcome at work, and invite colleagues to ask questions they may have once been afraid to ask. The Office of Disability Inclusion is a global, firm-wide operation. Our company has offices in more than 60 countries and reasonable accommodations are a part of how we do business around the world. So, if a candidate has the talent and skills to do a job well, we want them. And, we will provide as many tools as we can to help them do their jobs to the best of their abilities. SMG: Can you share any data on the number of company employees who identify as having a disability? Has that number increased since the Office of Disability Inclusion began operations? Sinocchi: As you imply in your question, disability is something that people self-identify. We know that many have disclosed their disabilities for the first time since the Office of Disability Inclusion was established. And we know that many were afraid to disclose their disabilities because they thought it might hinder their career. But we also know that we have more employees who are still getting comfortable with self-identifying and we’re working on making sure that they know we can help set them up for success. On the flip side, our employees who work with and manage people with disabilities are also adjusting to the new environment of openness where employees are self-identifying and openly speaking about their disabilities. SMG: Are there any partnerships with disability organizations that make the Office more effective? Sinocchi: JPMorgan Chase has an Office of Nonprofit Engagement (called ONE internally), which reaches out to specific communities and serves as a central point of contact for those communities to reach out to us as well. ONE has a robust and growing program to engage nonprofit organizations dedicated to helping people with disabilities lead full and barrier-free lives. Through ONE, we partner with many of the nation’s leading disability organizations to raise awareness of and provide solutions to some of the challenges facing specific communities. This level of formalized engagement gives our business leaders and product developers’ valuable information about how we can better serve our customers and employees. SMG: Have you developed any innovative training techniques that you would like to share—for the other employees as well as for the employee with a disability to form an integrated workforce? How do you think this will affect conversation on disability in the workplace? Sinocchi: We’ve been focused on creating a culture that encourages conversations about disabilities, which we believe will help to accomplish the fourth A: Assimilation. The more people can talk openly about disabilities, the more it means that able-bodied people can see beyond the disability and people with disabilities feel at ease. Mark Wafer, President of Megleen Treadstone and owner of several Tim Hortons coffee shop franchises, has transformed his businesses into much more than the routine place to enjoy caffeinated brew. Since opening his first franchise in 1995, Wafer designed his operations to be a proactive source of employment for people with disabilities. His success is now an established model that other businesses follow in doing the same. Wafer’s first experience of hiring an employee with a disability was prompted by supply and demand. Having purchased his first franchise, he was confronted by a scarce labor market and so broadened his employee criteria. With that success and others like it, Wafer found that hiring people with disabilities is not simply a matter of altruism —it is good business. He has since founded SenseAbility to help other businesses learn the advantages of expanding hiring criteria to include people with disabilities. Within a few weeks of purchasing his first location, Wafer added a second. Throughout the process, he continued to hire employees with intellectual disabilities. Not long after, he began to take note of the economic benefits to him that resulted from his inclusive employment practice. “The idea for this association,” he explains, “came from my time on the panel exploring the success in the U.K. As part of my interviews with corporate leaders I became aware of a group known as the British Forum on Disability and it was their ideas and procedures that gave us the idea of starting SenseAbility. This is a membership driven association with the express purpose of creating disability confident companies. We work with the CEO and executive level, as well as HR and operational managers. Today, twenty-one corporations representing 800,000 employees are members of SenseAbility.” The organization provides these companies with an abundance of information that they select in order to make it easier for them to hire people with disabilities into their companies. Tim Hortons Corporate is a current member of SenseAbility. They, too, recognize the benefits Wafer I did. The real success with the brand however has been with other franchise owners across the country and the U.S. In Ontario alone there are 500 restaurants that have hired at least one worker with a disability. People with disabilities do not make up a niche market. They are the wives, husbands, sons, daughters, brothers, sisters and friends found in every community. Indeed, they are a massive market segment for the goods and services of those who hire people with disabilities. As Marc Wafer attests, not only are they a proven employee resource, they are extensions of the promising economic networks encompassing them. Crucial to achieving those goals has been the partnership Ford built with Autism Alliance of Michigan (AAoM), a well-established organization offering case management and supports for adults with autism. AAoM CEO and President Colleen Allen points out that in constructing the program, from the very beginning, Ford was open to bringing people with autism to all levels of its company. Allen and her staff, all equipped with degrees in autism related fields, worked with Ford to develop the program and were responsible for the selection of the five individuals who currently participate in the FordInclusiveWorks pilot. Having officially launched on June 1, 2016 in the Ford product division, the program is still very much in its infancy. Nonetheless, Allen is already excited by what she sees. She anticipates that this success will spark a revolution in hiring people with disabilities, particularly those on the autism spectrum, not only in the automotive industry as with Ford, but in many other industries, as well. Ford data further explains that as FordInclusiveWorks took shape, AAoM and Ford partnered to review work at Ford that was both essential to meeting business needs, and was complementary to the typical skills and abilities of individuals with autism. Next, AAoM spent time observing employees performing the work, gathering integral information regarding work requirements, conditions, and surrounding support and structure that would contribute to success. AAoM worked with Ford supervisors to structure job duties, in addition to reaching out to local colleges, universities, and agencies to identify individuals with autism and the skills and/or experience to perform this work at Ford. The next phase of development focused on equipping Ford personnel. Prior to the start of the pilot AAoM provided autism awareness and effectiveness training for Ford Human Resources and employees who will direct and work adjacent to pilot participants. To ensure effective communication, natural supports are put in place within the Ford team, creating a greater likelihood of successful retention and high performance of pilot participants. One such support, the “On-the-Job Work Experience” portion of the program is coordinated by AAoM and provides job consulting to both pilot participants and to the Ford employees who work alongside them. AAoM also provides training for Ford employees involved in the program to increase their understanding of autism and a position everyone to better relate to their new colleagues. According to Ford’s May 25 press release, although specific skill sets vary for each job, all of the pilot program positions are located within the product development department. For example, in the vehicle evaluation and verification test lab, a FordInclusiveWorks participant will log and prep tires for test vehicles used by engineers for product assessment. The work is highly structured, according requiring a great deal of focus, and calls for a high level of attention to detail and organization. Skills required to complete this task (and other tasks) safely and with a high level of quality lend themselves to strengths typically associated with individuals with autism. At this phase of FordInclusiveWorks, AAoM candidates participate for 30-90 days of on-the-job work experience. During this pilot time period, Ford will assess the individuals for quality of work and fit within Ford culture. If quality and production standards are met, and a fit with Ford is positive, the individual will be invited to apply for the position as a Ford employee through Ford’s recruiting process. In 1986, a car accident left me paralyzed. When I returned back to school almost a year later, I still did everything career-bound college students are advised to do – got good grades, held leadership positions in student government, and became involved in a host of extra-curricular activities. Yes, I was now a person living with a disability, but I had no intention of derailing my plans to pursue a career in marketing. But when it was time to start my post-graduation employment search, unlike most of my classmates, I received no guidance from the Hampton University Career Planning and Placement Office. Looking back, I know they were willing, but we were all on unchartered territory. I was one of a handful of undergraduate students with a disability and they didn’t know how to support or connect me to resources or recruiters from companies or organizations with inclusive hiring practices. So I was left to navigate the job market on my own. I started out hopeful. During my senior year I had a number of initial interviews, and two of those companies actually called me back for a second round. Yet despite my accomplishments, and perceiving that I did well in those interviews, I wheeled across the stage with a degree in one hand and no job offer in the other. While my parents are sweet and patient people, they made it clear that I had to get a job. Heeding their demand, I continued to beat the proverbial pavement to no avail. Through a series of unexpected circumstances, Ralph Shelman, the executive director of The Peninsula Center for Independent Living, read an article about my accident and returning to school. He reached out to the university and, fortunately, Hampton contacted my parents to relay the message. A week or so later, I was in Ralph’s office interviewing for an Independent Living Counselor position. He hired me on the spot, and I began providing guidance and counsel to people who had their disabilities much longer than I, some from birth. On paper, I was woefully unqualified for this position, but Ralph gave me a chance. Since full-time employment was my goal, I didn’t really think about having any practical knowledge about the disability community or counseling. I had only been a person with a disability for less than three years and had no prior experience navigating the community and social supports for myself, let alone helping others. I jumped right in, and my boss wasn’t deterred by my learning curve. He had a solutions mindset, one that was willing to give a new graduate an opportunity to gain a foothold on the world. A mindset that could see past my wheelchair to my potential. A mindset that was willing to open the doors a little wider for someone with a disability. And without that mindset—that opportunity—I wouldn’t be where I am today. 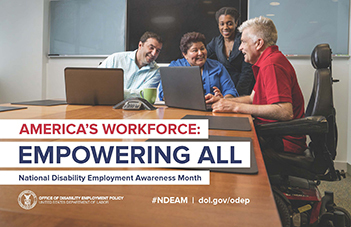 October is National Disability Employment Awareness Month (NDEAM) and the time of year when the disability community and many employers spotlight disability employment and inclusion in small businesses, local/state/federal agencies, and corporations. NDEAM, supported by August 2016 data from the Department of Labor, reminds us that the unemployment rate of people with disabilities is 11.3%, while the rate amongst people without disabilities is 4.8% – almost 3 times higher than the general population. As disability inclusion has grown, NDEAM can be a catalyst for moving beyond awareness to creating an opportunity mindset among decision makers. Much like my former boss, employers with an opportunity mindset seek to address what’s needed to open doors wider to enable people with disabilities to apply for positions they are most qualified for. It looks at what people can offer, removes the stigma of disability, and understands that diversity of thought and experience makes for a richer culture. Start with why. 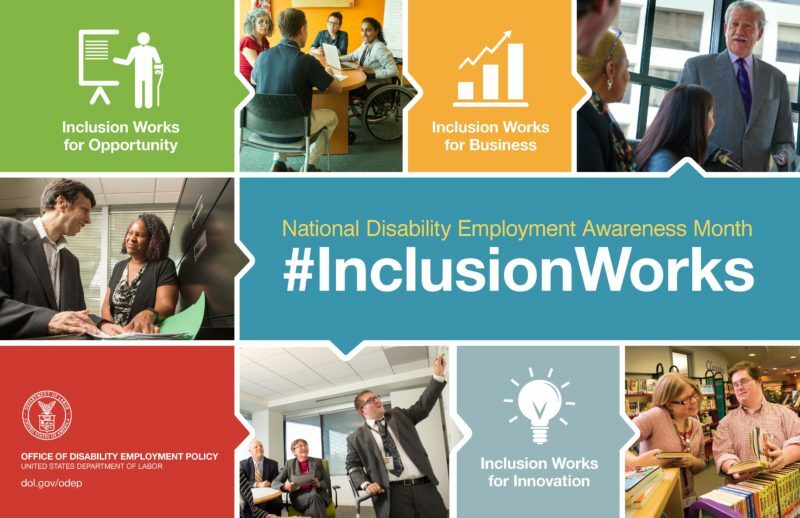 Why is disability inclusion important for your organization? Be honest. What has your organization done to identify, recruit, onboard, and retain individuals with disabilities? What was the outcome? Have a champion. Who is the leader that has the authority to drive disability inclusion? What additional leaders and/or departments need to be engaged across the enterprise? Buy-in is Critical. What are your internal stakeholder’s biggest objections about disability employment? What steps can your team take to counter objections? Define a measurable goal. For example – The XYZ organization will hire a certain percentage of employees with disabilities by a target date. By making this clear your organization can outline action steps to achieve this goal. Build partnerships. What disability organizations do we need to build relationships with to access talent, locally and/or nationally? I hope these questions will help your organization take important first steps to develop an opportunity mindset during NDEAM. If this discussion guide is beneficial to you, please send me an email at cjones@disability-marketing.com.